The importance of global trade and logistics to the Southern California economy was in plain view Friday in Long Beach. Nearly 400 students, teachers, employers and policy makers attended the Global Trade & Logistics Regional Summit in Long Beach, sponsored by seven community colleges working together to develop curricula aligned to industry needs. 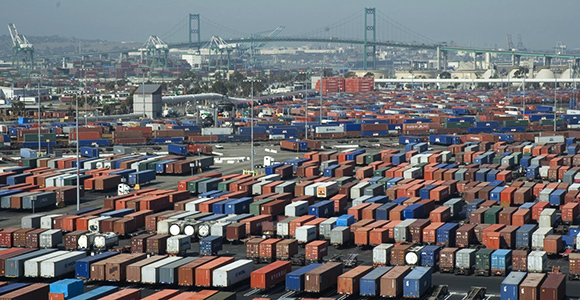 Global trade is a major part of the Southern California economy--40 percent of the goods that reach the United States from the sea come through Southern California’s two ports. For different regions in California, there are different economic needs--and efforts like this summit are underway around California to connect students, community colleges and employers. California’s workforce preparation crisis is well known. The California Economic Summit has issued the challenge of recruiting and training one million new middle-skills workers for California’s growing economy. Governor Brown and the Legislature seem to be hearing the message. They are expected to approve $200 million included in the state budget and aimed at career technical education funding for the state’s community colleges. While that public policy development is critical, Friday’s meeting was more about students getting to meet with employers and learning about the job opportunities available in trade and logistics. UPS had a booth at the event and met dozens of students. “We were here recruiting,” said Patrick Landis, a 24-year employee who is the international sales manager for UPS in Southern California and started his career in one of the entry-level jobs that students were applying for on Friday. “Global trade and logistics are changing fast and we opened some eyes today about the opportunity in logistics and goods movement,” Landis said. In addition to UPS, a number of other employers and foundations met with students. One in particular had a 21st-century feel. “There’s a new opportunity out there in the field of robotics and it’s called drones,” said Jolin Crofts, director of business development for UAV Systems Association, one part of the Tesla Foundation Group that is promoting the 21st century economy. For the generation that is entering the workforce, already adept at video games and comfortable with technology, this area is a great opportunity, Crofts added. In the meantime, the pressure is on community colleges to better and more efficiently work with employers to create a job-ready workforce. Probably no person in California has driven this workforce preparation issue more effectively in the last two years than Van Ton-Quinlivan, vice chancellor for workforce and economic development for the California Community Colleges. “These types of events show the importance of regional coordination to build skills in our students that employers want. That's how we deliver a strong workforce for California," said Ton-Quinlivan. Events like this show that the work is underway. The logistics summit featured the collaboration that seven community colleges (Los Angeles Southwest College, East Los Angeles College, Mission College, Harbor College, West Los Angeles College, Santa Ana College and Santa Monica College) have been doing to align curricula and educate students to identify and recruit persons to fill the thousands of jobs the global trade and logistics will need.